I’m prepping my MacBook for this evening’s Brittain Fellow Digital Pedagogy seminar. 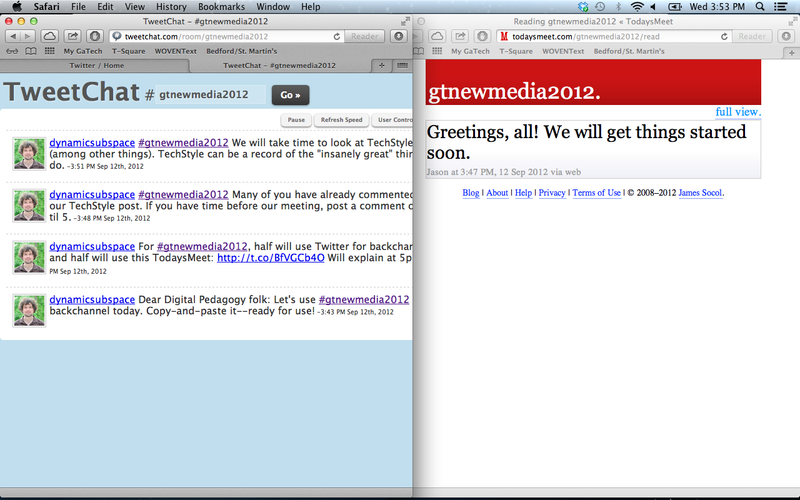 As you can see above, we are going to be running simultaneous backchannels–one on Twitter and one on TodaysMeet.com. Besides looking at how these technologies work, we will do other things with the words that we write with Wordle and Storify. Details of the meeting including readings and technologies are available on TechStyle here. I will see my fellow Britts in Skiles 302 shortly.